Just registered here, as I'm having really hard time booting onto a VHD. My ultimate goal is to load a Linux from a VHD image and boot it through the Windows boot manager, and this forum seems to be the ONLY place on internet discussing/having any knowledge regarding this topic. The Windows 10 entry boots OK, but I can't boot onto the Ubuntu entry. What could be the error I'm doing here? AFAIK this is how it is done in every tutorial/guide I've come across. The error I'm getting is "Windows failed to boot... The file \Windows\system32\winload.efi could not be found or is corrupt". It is presented on a legacy-looking black screen. Although in the right bottom corner it says "Press ESC to go to UEFI settings.." so it is not trying to boot a MBR/BIOS image. Worth mentioning would also hopefully be that booting Windows 10 entry from the list DOES NOT make my PC reboot, but when I select the VHD entry (Ubuntu), the PC reboots, and then gives me this error. Edited by jussihi, 16 January 2019 - 12:33 PM. which is the file for booting Windows. Also systemroot \Windows is certainly not ok.
How did you prepare the ubu.vhd ? I have no experience with booting Linux from VHD. Thank you for the very quick response, wimb! The reason I thought this would work is the video I followed ( ). It had some preconfigured vhd file attached, and the presentator showed how to add it to the Windows bootmanager. Thank you for the link to the UEFI_MULTI, but I can already boot the Linux from an USB. My main goal is actually to get rid of that USB stick, so I could boot the live Linux without the USB stick. but my system is a UEFI/GPT only, without the legacy BIOS support, so the grub4dos doesn't work, as it only works with BIOS/MBR afaik.. Or am I wrong here? Sure, most of the info is there and you are right, the grub4dos will only work on BIOS (both on MBR and GPT "style" disks), buit there is still GRUB2 (which does work on UEFI and does allow booting from a RAW file with a sector appended, which is what a static VHD is), if you continue on that thread /around page 3, you will start finding some references to GRUB2 use, including some special/modified versions capable of booting also "dynamic" .vhd's. Unfortunately, for *some reasons*, the whole stuff about Linux booting from a VHD (static or dynamic) seems like being not very popular (not only - as you noticed - elsewhere) and the information available is scarce. What is not seen in that video (or maybe I missed it) is actually booting the Ubuntu from the VHD. and then select in Grub2 menu to boot with Windows Boot Manager Or with Linux ISO located in folder images on FAT32 EFI partition (Ubuntu and Knoppix and Linux Mint were tested). However, I must use BOOTICE to make UEFI Grub2 entry and must boot via F8 menu and then select this UEFI Grub2 entry. Otherwise I get straight Windows Boot Manager. Thank you both for your very good points on this topic! Is there any way to chainload GRUB from Windows boot manager, or alternatively install the GRUB EFI binary to the EFI partition and then boot that EFI binary WITHOUT entering the UEFI BIOS? Does a normal Windows-only installation even have its own separate EFI partition? So, for both of you; my goal is to somehow boot a Linux ISO/VHD on a Windows-only system, without an external USB stick and without the need to get into / touch the UEFI/BIOS firmware settings. Is this possible? I thought that a Linux installation with a custom kernel inside a VHD (which I could boot through Windows boot manager) would work, but now it seems to be impossible. And wimb, I did not prepare the ubu.vhd in any way, it is the same file linked in the youtube video - I was just trying to get something working as a kind of proof-of-concept first before trying to do my own VHD and own GNU/Linux installation on it..
You don't have to enter the UEFI BIOS. In Windows 10 I used BOOTICE to make UEFI Grub2 entry for my internal SSD with FAT32 EFI partition. And then I Select from F8 Boot Menu this UEFI Grub2 entry. So I can Boot Linux ISO located in folder images on FAT32 EFI partition on internal SSD / GPT having Windows 10 x64 system on second NTFS partition. I don't see a link for this ubu.vhd. Can you give a download link ? Yeah, this is great, as I can programmatically do this UEFI installation (adding the UEFI entry) myself too using the SetFirmwareEnvironmentVariableEx call.. Just have to figure out how to alter the EFI partition from a Win32 program that I'm writing. And I can also "lend" the Ubuntu bootloader efi binary, which is already signed so it works with SecureBoot also! Edited by jussihi, 16 January 2019 - 05:18 PM. What's the request? Do you search a solution for one machine? Do you search a general solution for all machines? Be aware, there are differnt UEFI implentations in real world. Some boot NVRAM first entry. The file name is read from NVRAM, can be grub2 or windows default file names. Other boot a fixed file name, e.g. /EFI/Microsoft/Boot/bootmgfw.efi This can be a renamed grub2 file. -if you press the boot hotkey, you may see a selection choice. And there is a backup without a NVRAM entry, 64bit UEFI file name /efi/boot/bootx64.efi. A general solution is difficult. Edited by stayboogy, 17 January 2019 - 02:51 AM. and yes, uefi installed windows has to have a separate efi partition, on both mbr and gpt uefi installs. won't work because you are trying to load \Windows\system32\winload.efi from your Ubuntu.vhd which would not have that file present because that file is only present in a windows install. you have confused the bcd for the bios uefi boot manager which is what you need for what you trying to do. the tutorials you have seen are not doing what you are trying because it will never work. to possibly get ubuntu booting from vhd, you will need the grub2 efi firmware. copy the EFI folder from a Ubuntu installed in uefi mode--which requires the first partition of a gpt disk to be a fat32 partition, just like for windows (which will work both mbr/gpt disks), then you have to mount it to /boot/efi under linux, then grub-install from the terminal using the switch for x86_x64-uefi to the mounted path of the efi partition. copy the EFI folder from said ubuntu install to the efi partition that boots your uefi installed windows. then change your bios uefi boot settings to boot the grubx64.efi firmware image and give that a boot entry in the bios settings. that's the only way you'll ever load the grub efi boot manager. you might possibly be able to realmode load grubx64.efi from the windows bcd but i doubt it. you'll then have to change your grub.cfg to load your vhd, which that is something i do not know how to do. Edited by stayboogy, 17 January 2019 - 03:00 AM. There is no need to boot with WIM file. I have Multiboot from internal SSD of Linux ISO's and Windows 10 x64 booting with UEFI Secure Grub2 of Linux Mint perfectly working. However, I had to make space on my FAT32 EFI partition to accomodate the Linux ISO files located there in folder images. 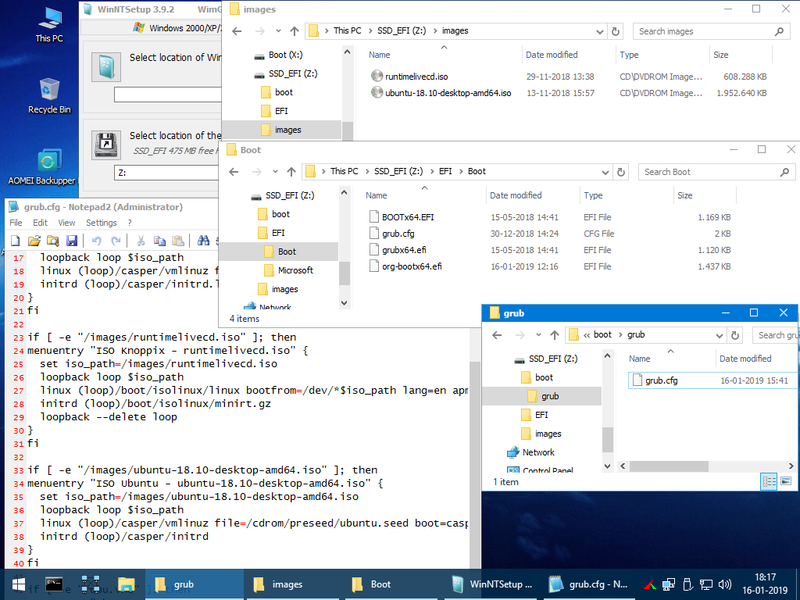 It would be better when I can have the folder images with Linux ISO files located on the (hd0,gpt2) NTFS partition with Windows 10 x64 OS. I cannot get the Linux ISO files booting when located on NTFS partition. Is there a solution and can anyone help me to solve this problem ? Thank you for all these great replies, I'll try to answer to those below. As you can see, I'm more of a Linux guy than Windows... That's why all this Windows boot manager stuff is pretty unclear for me. yes, no need to boot the Windows, actually I think you can just use "mountvol X: /s" to mount EFI to X:/. And no, insmod ntfs is a command for linux, in grub you have not yet loaded the kernel, so of course it cannot load the linux kernel driver. EDIT: Actually it seems like there is NTFS support for GRUB. Does your grub folder in the EFI partition have "ntfs.mod" inside it? Maybe you are missing the ntfs module, and that's why it cannot load it. I would like to create as-universal-as-possible solution to boot a live Linux from the existing Windows NTFS filesystem, pretty much like the GRUB4DOS does, but for UEFI/GPT systems. I see there are some problems, as some laptop makers try to force booting of the windows boot manager EFI binary, as you said. Is there any other kinds of workarounds for these, other than replacing the original /EFI/Microsoft/Boot/bootmgfw.efi on the EFI partition? Edited by jussihi, 17 January 2019 - 09:08 AM. I have a copy of old Ubuntu installation's GRUB EFI loader, which is Secureboot friendly and has the ntfs module (and a lot of other modules too). Should I upload it here so you could try it out..? Edited by jussihi, 17 January 2019 - 09:25 AM. Yes, please upload it so that I can try it. Do you have NTFS support when booting with that Grub2 of Ubuntu ? And can you launch Linux ISO when located on NTFS -partition. Edited by jussihi, 17 January 2019 - 10:09 AM. Thanks for uploading Ubuntu Grub2 and for your suggested menuentry. @wimb, what is the GRUB command to load the ISO file from a file? I will get home in some 2-3 hours so I will test with some Ubuntu ISO. I have succes with three Linux ISO files booting in UEFI Secure mode using Linux Mint Grub2 and ISO files located in folder images on FAT32 EFI partition. I'm having the same issue.. Didn't know that you can't load modules when securebooting. I guess these modules should also be signed. Next I'll try to use bootx64.efi (I guess this is a signed shim) and grubx64.efi from https://github.com/n...master/EFI/BOOTand see if it works, the owner of this repo says that the ntfs module is included in the grubx64.efi he offers. Edited by jussihi, 17 January 2019 - 02:21 PM. Ok so there is may be no NTFS support possible for hosting Linux ISO files in case of UEFI Secure boot. Anyway we have a good working solution by increasing the size of the FAT32 EFI partition so that the Linux ISO's can be located there. In Windows 10 one can use BOOTICE to make UEFI Grub2 entry for the internal SSD having FAT32 EFI partition. And then for booting Linux ISO one can Select from F8 Boot Menu this UEFI Grub2 entry. Changing the size of the EFI partition is not desirable. If you have another FAT32 local drive available or can make such drive then the Linux ISO files can be located there ! 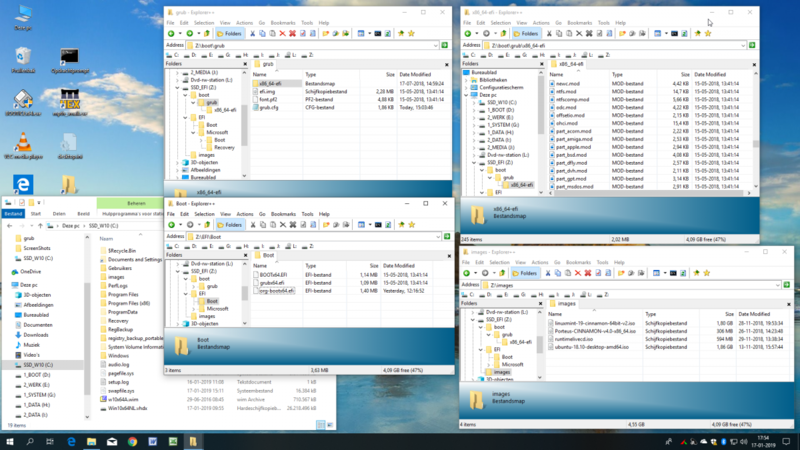 Then I created a FAT32 partition of 10 GB at the end of my SSD / GPT with Win 10 x64 OS and copied folder images with Linux ISO's to that location. Now I need to use (hd0,gpt3) instead of (hd1,msdos1) in the above given menuentries and then everything works ok. So you need a FAT32 partition that can be located on internal hardisk or SSD with MBR or GPT partitioning. so that the computer always is booting first with Grub2 Menu, which has as default to continue with Windows Boot Manager. In the EFI\Microsoft\Boot of Windows Boot Manager we can use in the Boot entries the setting BootMenuPolicy Legacy so that there is no reboot. You can use BOOTICE to adjust the BCD of current system in Professional mode.